Stephen Gough was arrested seconds after he was released from Perth Prison in December after he walked out of the gates with no clothes on. 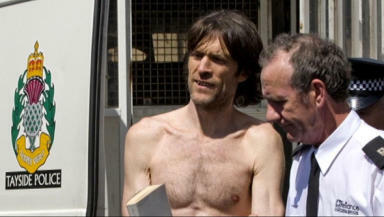 Naked rambler Stephen Gough is set to spend the rest of his life behind bars in maximum security Perth Prison - unless he puts on a pair of trousers. Gough - who has become notorious for trying to walk around Britain naked - was arrested within seconds of being freed from the jail on December 17. He was found guilty at Perth Sheriff Court on Monday of breaching the peace by walking naked in the street and refusing a request by police to put some clothes on in public. The eccentric ex-lorry driver was warned that he would continue to be jailed every time he stepped out of the prison without any clothes on. On the past two occasions when he has been freed from jail, officers from Tayside Police were waiting at the jail gates to re-arrest him. Sheriff Lindsay Foulis told Gough he would not have to be "crystal ball gazing" to realise that the same process would occur "again and again and again." Gough - who has spent the bulk of the past seven years in jail for identical crimes - turned down an offer to walk free yesterday on condition that he get dressed. Sheriff Foulis told him he would consider granting him bail to go back to his "warmer" home county of Hampshire if he agreed to put clothes on, but Gough said he would not. He said: "A number of your recent convictions have arisen in similar circumstances. You have more or less been apprehended when you have been released from prison. "When the day comes from you to be released from a prison establishment you will be apprehended and the same process gone through again. This is what has happened over the last while and if I impose a custodial sentence that is a scenario which is likely to arise again and again and again." Gough said he accepted it was "potentially" the case that he could remain in jail forever - apart from the few seconds of freedom he enjoys every six months or so. The 50-year-old turned down the offer to go home to Eastleigh in Hampshire to see his mother because he would not accept the condition of getting dressed. Gough said: "Essentially this is about individual freedom and people's tolerance to other people being different. I understand a lot of people will disagree and have strong feelings about it. "Walking the amount of miles I have, through towns and cities, it is on the whole a very small moral minority who act in an irrational way. I believe I am behaving in a reasonable way." Gough was allowed to conduct his own defence in open court while completely naked and the sheriff said he would consider whether that was a contempt of court when he is sentencing. He warned Gough that he could be jailed for upwards of 18 months. Gough, of Chamberlayne Road, Eastleigh, Hampshire, was found guilty of breaching the peace near Perth Prison on December 17 and was remanded in custody. The sheriff also ordered psychological and psychiatric reports.